Best Western Rewards members can redeem 10,000 points for weekday nights in the US & Canada through January 15, 2019. Best Western Rewards members earn double points for stays through November 18, 2018. Air Canada Aeroplan members can earn 750 miles (250 base + 500 bonus) for stays October 1 – December 15, 2018. Choice Privileges is having member madness week November 12 – 16, 2018. Choice Privileges members can earn Gold status after two Cambria stays b February 28, 2019. Air Canada Aeroplan members can earn 1,250 miles per stay through December 31, 2018. 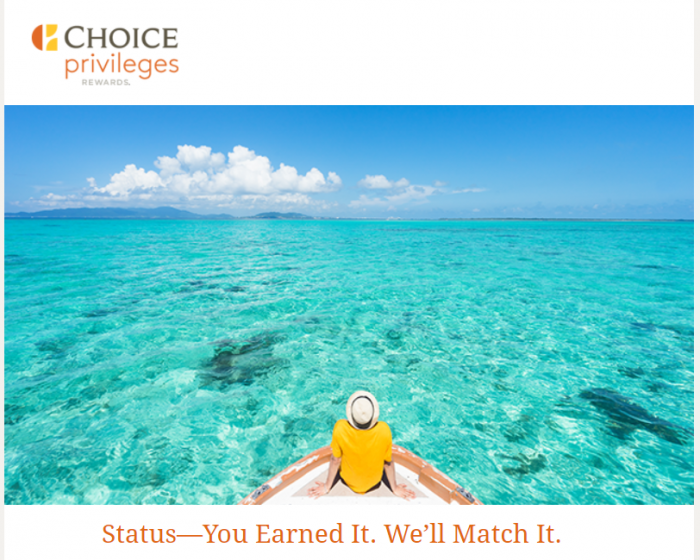 Choice Privileges is offering status matches for members in United States, Canada and Europe. The status is now valid through early 2020. World of Hyatt members can earn 2,000 bonus points for stays of four nights or longer through December 31, 2018. World of Hyatt members can purchase points at 40% bonus through November 27, 2018. World of Hyatt members can earn up to 60,000 bonus points for stays through November 30, 2018. World of Hyatt members can earn double points for stays at MGM properties in las Vegas between October 1 – December 29, 2018. Radisson Rewards members can earn double points and elite qualifying nights/stays on Premium Rooms through December 28, 2018. Radisson Rewards has launched targeted offers for stays through December 28, 2018. Radisson Rewards is offering Air Canada Aeroplan members 2,500 bonus miles per stay in addition to points through November 30, 2018. Wyndham Rewards now offers status matches to its Gold, Platinum and Diamond level from competing programs. Bit slim pickings for a general bonus promotion among these five. Hyatt has theirs going until the end of the month. Others have targeted offers, bonus miles with airlines or nothing. Next articleMarriott Rewards Ambassador Service Email Inbox Full?